GSA form 873 or the "Annual Attendance Record" is a form issued by the U.S. General Services Administration. Download a fillable PDF version of the GSA Form 873 down below or find it on the U.S. General Services Administration Forms website. *10 hours pay period ending 12/22. 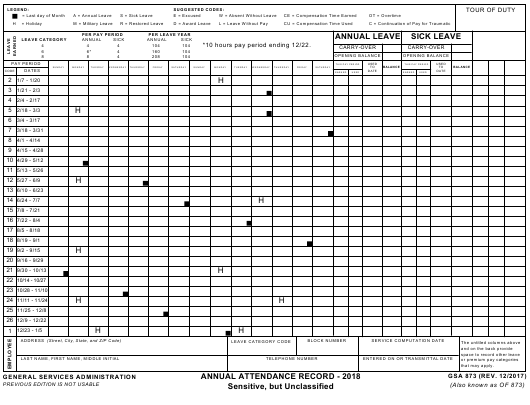 This optional form is for timekeepers to use in recording daily and bi-weekly pay and leave activity. The form is a record of what SHOULD BE recorded into the official payroll system. Compensatory Leave, and Credit Hours. Premium Pay hours include Environmental Differential Pay, Sunday Premium, Night Differential, as well as Overtime, and can be included.